MX-15.01_386 on live usb with persistence on 64bit CPU. 2) Can you boot to the desktop? Yes, I can boot to the desktop. Everything works OOTB with one minor exception (see #4). 4) What doesn't work OOTB? Did you find a fix? On shutdown the 'antiX Save Persistent Root' window (pic attached) opens with the Yes and No buttons below the monitor (i.e. not visible) and the window cannot be resized. The fix is to grab the window with the alt key and move it so the buttons are visible. Everything works fine after that. Jerry3904 wrote: We're looking to collect info for specific laptops running antiX-15 or MX-15. Please post here, and we will take care of reviewing for the Wiki. 5) Compared to MX-14 on the same machine, it feels more responsive, users fewer CPU cycles (I'm using one of the CPU monitor panel plugins), and as a result runs cooler. I've yet to hear the fan speed up to 100%. It also seems to be more efficient with memory consumption, even though it is 64bit. I think it may have something to do with my use of IceWeasel on MX-14--it seemed to have a memory leak that would cause it to bloat over time. On MX-15, using the default Firefox and so far after a day of use, it seems to be holding its memory consumption better than IceWeasel did. 64-bit laptop running Windows 10. My live USB snapshot of MX15 with liquorix 4.3-3 kernel ran well after disabling Secure Boot. Navigated with touchpad so it worked. Wireless card detected and connected fine to the internet. Sound worked. I was able to adjust volume and screen brightness with the hardware Fn keys. Flash/youtube worked. I use the old Lenovo B460e. MX 15 32 bit. Works out of the box, the only distro that works OOTB. Everything that comes bundled up works fine. The only thing I would say, as a comment, is that, maybe there could be a more modern desktop ootb. A good splash theme with MX branding for starters would be awesome. Regarding the system,its rock solid and does its job fantastically well. Sure, we can add gtk themes, icon themes but still, maybe more branded artwork is needed. 5) master sound is 24%, I guess you assume I install in library....how about 70% as default? 3) Almost everything minus BT. 4) BlueTooth seems pretty broken. It has trouble connecting to my phone and when it does it can't seem to do anything. It also fails to to play music through my BT speaker. 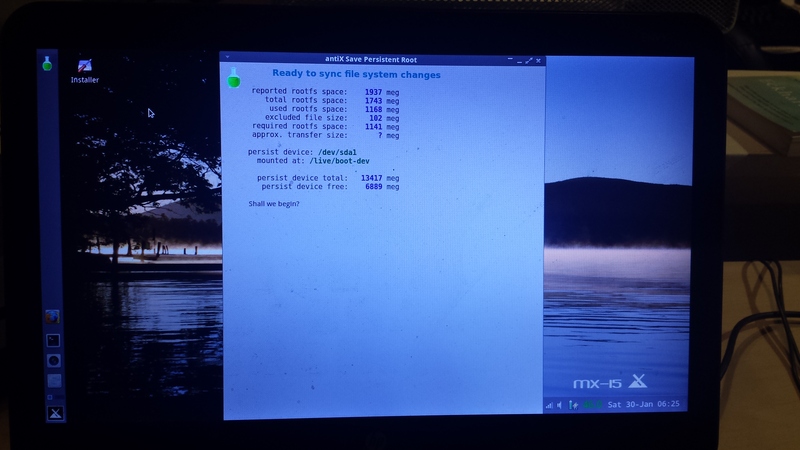 5) I'm considering MX-15 as the next distro for this laptop. @eladhen, did you download a snapshot or the original release? I ask because since the original release we have updated blueman and would like to know if it is the newer version you are having trouble with or the original. v3g4n wrote: @eladhen, did you download a snapshot or the original release? I ask because since the original release we have updated blueman and would like to know if it is the newer version you are having trouble with or the original. I booted it with the latest October snapshot. I would really like to make Bluetooth work and I'm willing to do some testing if you can tell me what to try. My media center is a Thinkpad T410. It's old, but still has some UMPH.